Tourist-Channel Slovakia - Andovce Tourist-Channel Slovakia: New homepage! Village Andovce is situated in the Small Podunajská lowland between the rivers Váh and Nitra, 5km to the southwest away from the district town Nové Zámky. 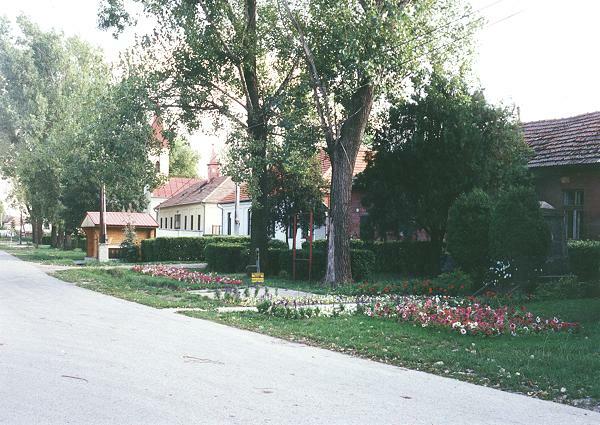 Area of village is 1000ha, is flat with an average absolute altitude 115m above sea level Number of inhabitants is 1200, thereof 75% are of the Magyar nationality and 25% of the Slovak nationality. Inhabitants of village are employed in the companies of agricultural resort, or at Agroter s.r.o., Agroker s.r.o. and in business sphere represented by Elis (processing of timber), Madplant - a gardening centre, Lagin - production of clothes, Zlatý klas - a bakery. Access to village is provided by road by bus connection SAD. the Church of St Rozália from 1858, when the former Church from the half of the 18th century was enlarged and got the present-day look. Statue of St John Nepomucký from 1800 situated near a road. a multipurpose playground for tennis, basketball, volleyball, field hockey. In the winter it serves as a ice rink. shops - foodstuff, domestic equipments, gardening tools, news service, tobacco products. This project was realized thanks to financial support of the program Tvoja Zem provided by the Foundation Ekopolis and ETP-S and financed by the United States for International Development together with other private and public donors.